TorFX offers a rate improver guarantee and can match or beat any valid quote from banks or other providers. If you’re going to have mortgage or rental payments to manage, find out more about our Regular Overseas Payments service. Buying property overseas? 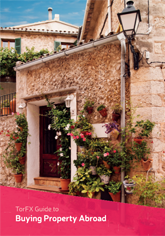 Our free guide is full of top tips to help you navigate the foreign property market and provides useful information on subjects from locations to solicitors.